In the small town of Cochrane – approximately half an hour from Calgary, Canada – you will find The Pony Fairy – Monty Gwynne. Monty’s farm is surrounded by views of the distant Banff National Park – with Banff being about an hour’s drive away. And on the farm you will find Monty and her beautiful horses and ponies! I was fortunate to spend a week at one of Monty’s clicker training clinics. Alex regularly visits Monty to see the horses! I was visiting from Australia – so this was a real treat for me! 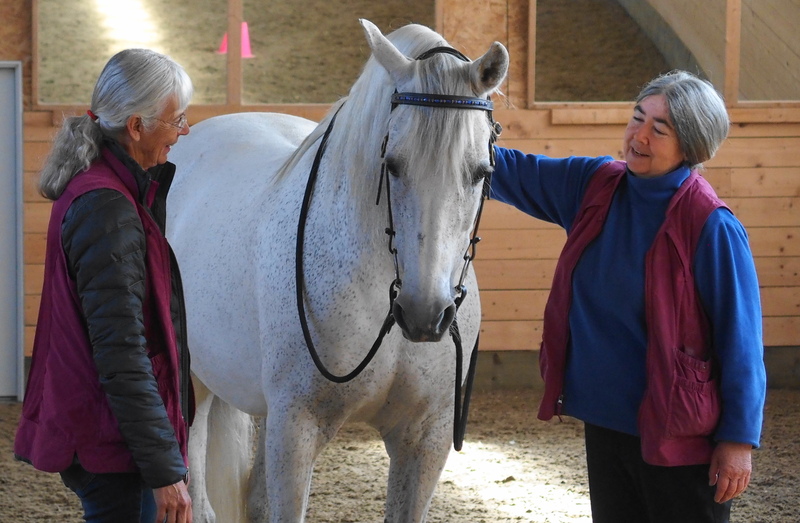 Not only did I get to share the learning with others – I was able to stay in Monty’s house, enjoy gourmet meals and do nothing but watch, learn, absorb, enjoy great conversations – and play with horses! It was a real break – and for me this is the ultimate in pampering! I didn’t have to do anything!! 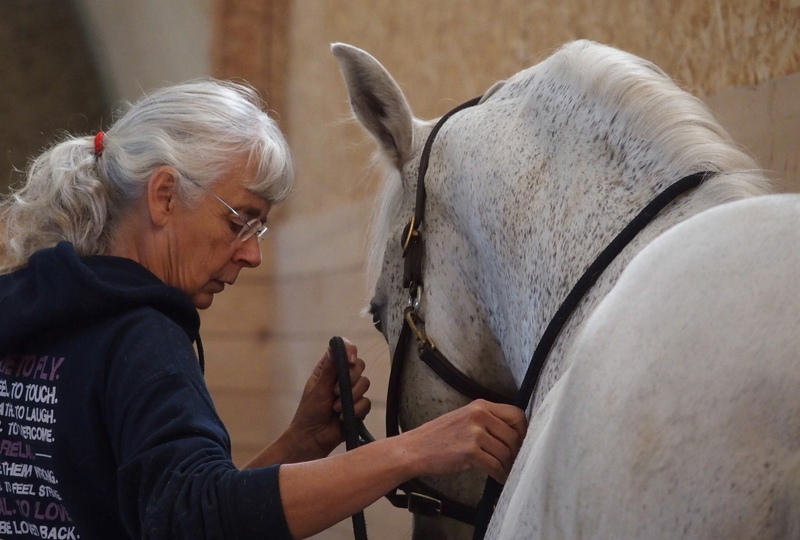 I could fully relax and be with the learning, the horses, the people – and the environment. It also allowed me to take many photos – which is not only a great souvenir to take home – but a lesson in capturing the ‘moments’ – the placement of hooves, hands – or capturing a look in the eye etc. Monty’s enclosed arena is light, ever so quiet – and has a special energy of its own. 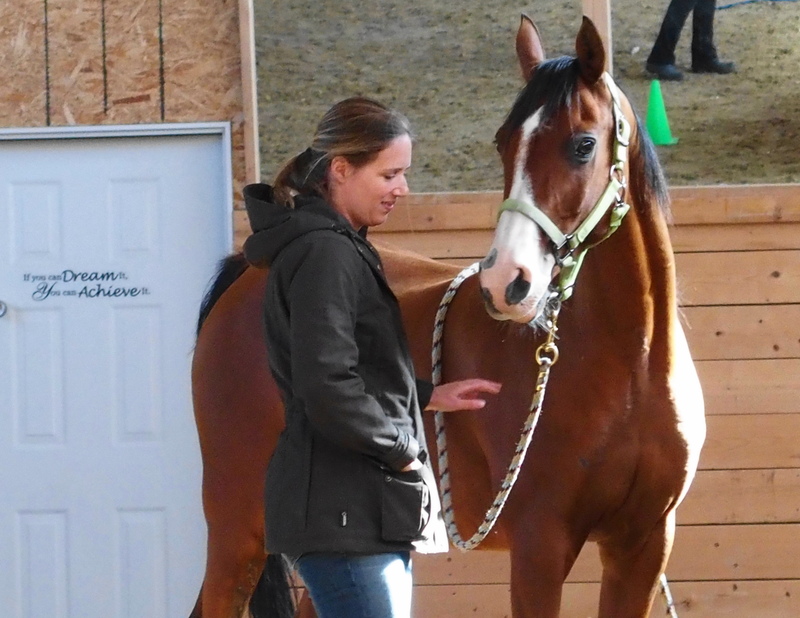 It allows human and horse to really focus on each other and makes for a very happy learning environment. And I love the sign on the door! “If You Can Dream It – You Can Achieve It”! Very inspiring! ANDREA – FROM GERMANY – WITH FLASH! 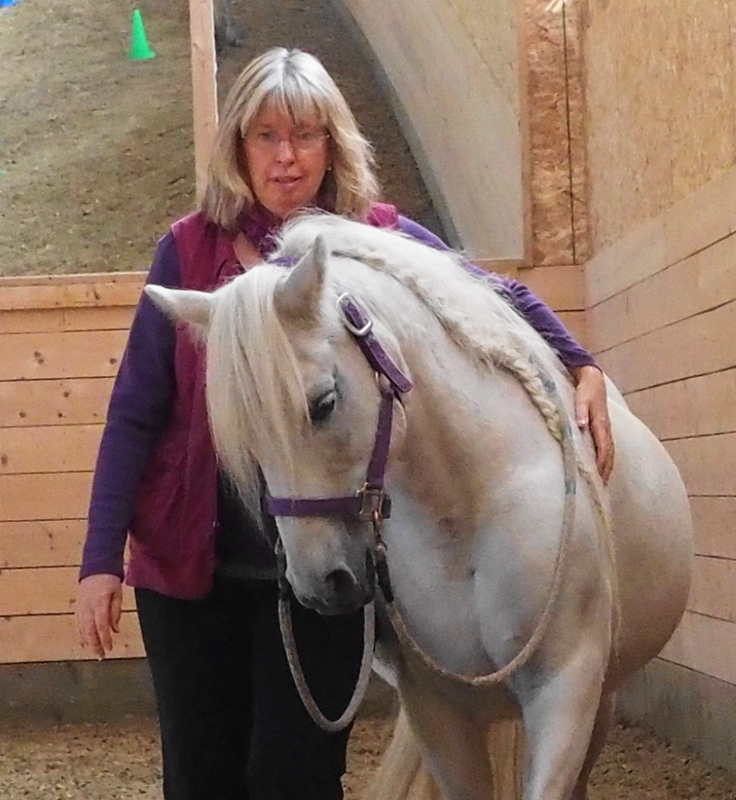 Monty has such a wonderful variety of horses and ponies – some very highly trained – and others just beginning their work. There really is a smorgasbord of equine friends!! 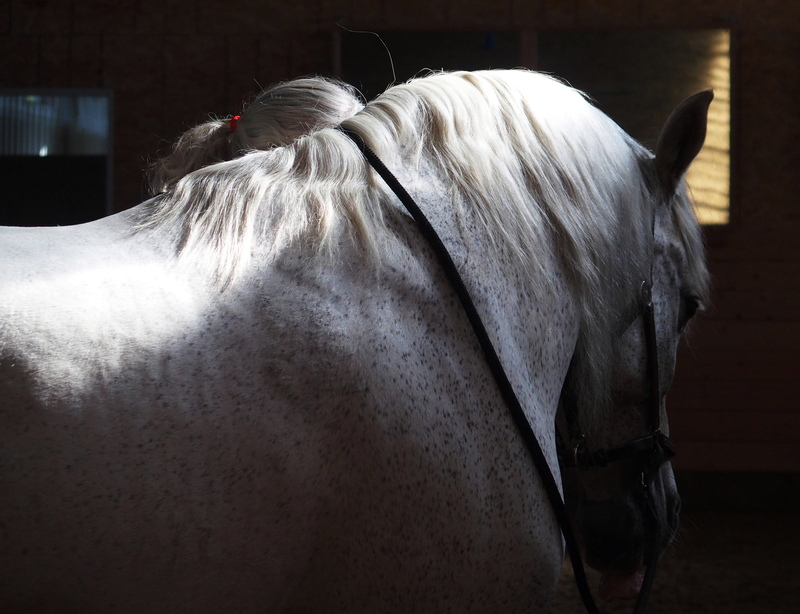 While it is very possible to take your own horse – there is a great advantage in attending without horse – and learning from Monty’s. You won’t see any whips or hear any yelling – you will see horses just so keen for their turn to play – they may greet you with a hug or a kiss – they will lower their head to have their halter put on – they will meet you at the mounting block – they will lift their legs to have their hooves cleaned – or they may bring you a ball to play with – or show off with their favourite move. 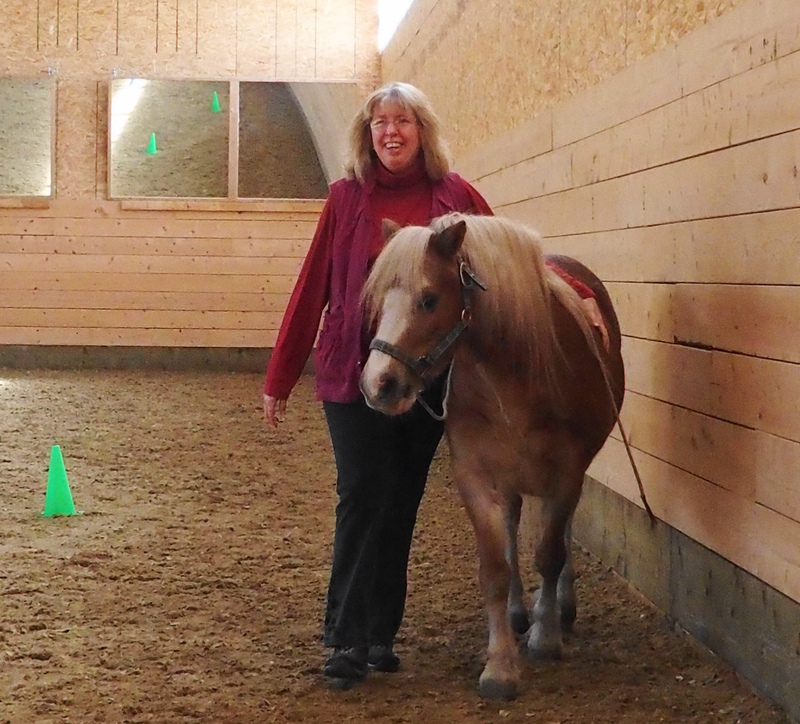 All this brings such a sense of fun and relaxation – happy horses and happy humans! ANOTHER ‘HUGGING WALK’ – THIS TIME WITH SNOWY! So what does Monty do that is so special? In my opinion – it’s about balance – physical, mental and emotional balance. When the horse is in balance it can truly feel great! When the horse understands what you want, you have such enthusiasm and joy! Every move is broken down into the smallest of steps – rope handling becomes an art – horse and human end up in a dance. And when it is all put together it is magnificent! 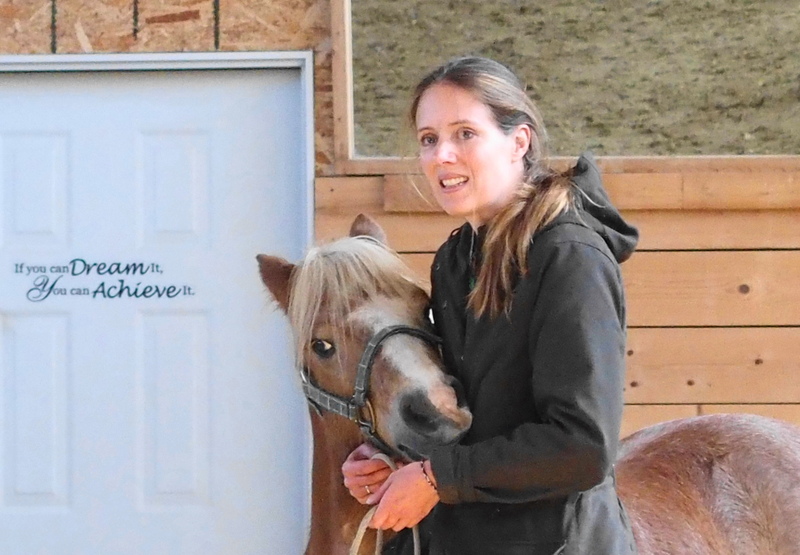 And it is all done with positive reinforcement – that is – marking the behaviour you are looking for with a click – and delivering a treat to the horse to reinforce the particular behaviour. 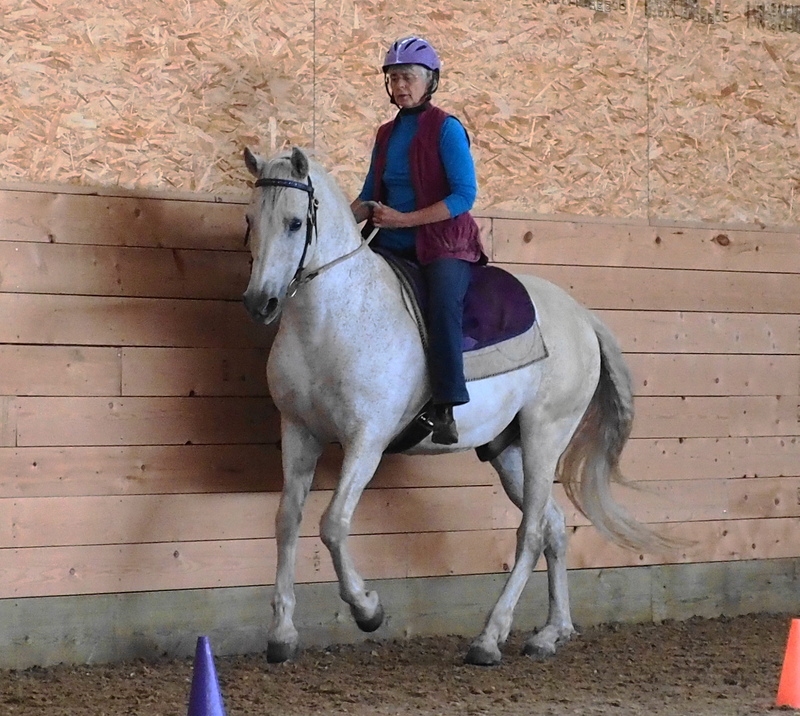 BERNICE – GETTING A RIDING LESSON WITHOUT A HORSE! And – what did we do??? Have a look at the slideshow! 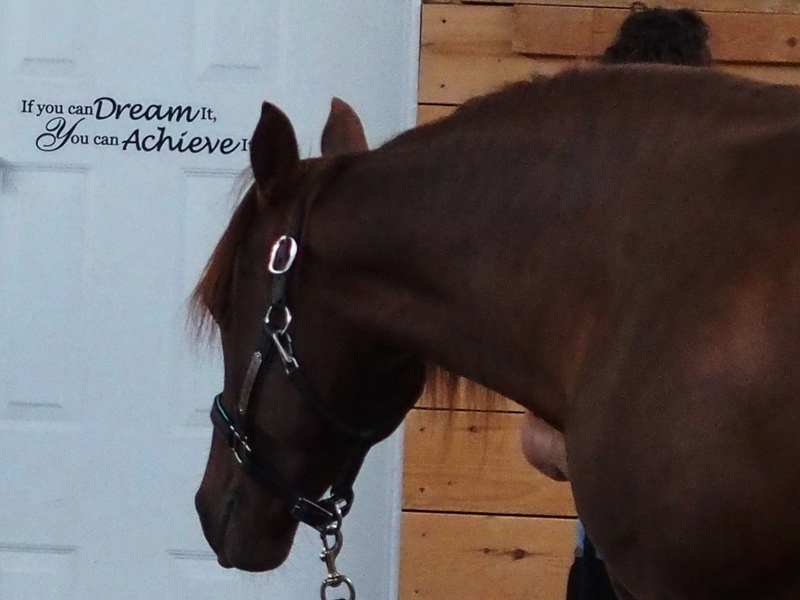 As I am studying Alexandra Kurland’s online course I already had an understanding of clicker training, food delivery and the foundation lessons – but I am only a little way through the course, so it was great to experience more of the advanced work with horses that knew what they were doing! They were training me! Please click here to see a clip of – first Andrea – then myself – learning from ‘U’! 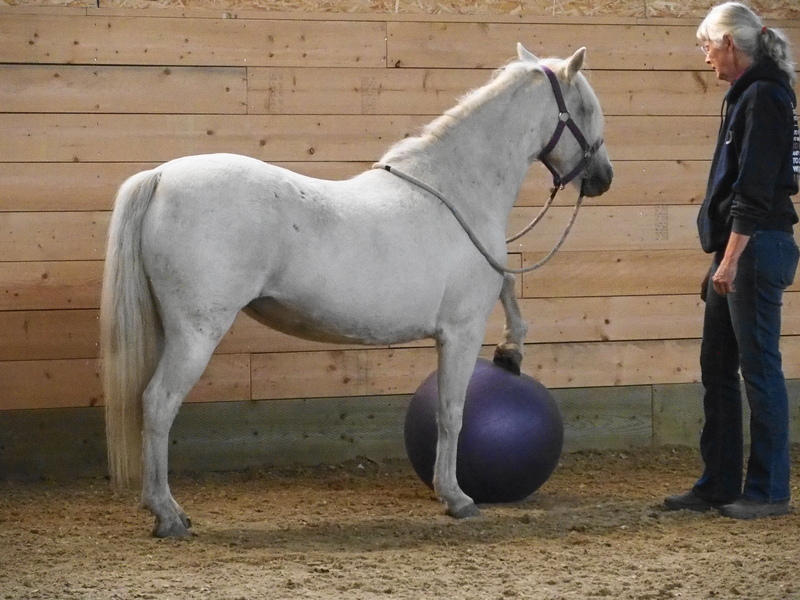 Monty had also asked each of us what we would like to work on – and one of my horses, Magnum, has issues with lifting his hooves, so Monty was able to give me some great ideas. 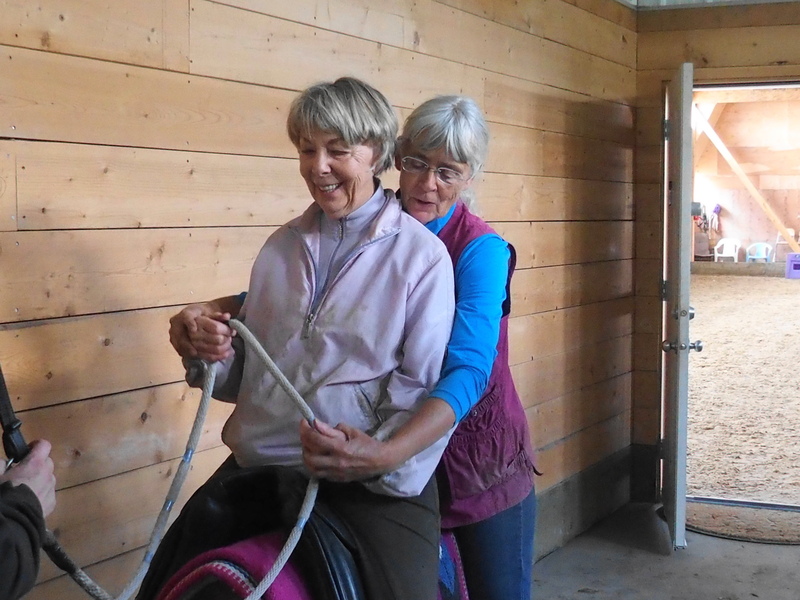 Others were working on areas of ridden work – or fine tuning rope handling etc. – but it was all relevant to me. Monty also gave us a beautiful demonstration of her work with Icky. It is truly something to aspire to. We saw both ground and ridden work – and the two are a delight to watch!!! Some course participants were local – others had travelled a long way – like myself from Australia – and Andrea from Germany. We both took part in the whole week and managed to fit in a flying visit to Banff. Others were there for several days – either at the beginning or end of the week. Also assisting Monty with the horses is Shannon – who does the same beautiful work – and is also very handy when it comes to IT or camera problems! It was so interesting to meet everyone and I will have more stories about them to follow! I’m hoping to return to Monty’s next time I travel – but for now I keep the ‘moments’ in my head and apply what I learnt to my own horses. REMEMBER – IF YOU CAN DREAM IT – YOU CAN ACHIEVE IT!! For details on upcoming clinics and more information please contact Monty Gwynne at mgwynne@xplornet.com – or find more details at The Pony Fairy. Thanks for sharing your pictures and memories from your visit to Monty’s. Thanks Mary! I’m still working my way around the finer details of blogging and how to share the blog to more places! Great to share this wonderful journey with you in words and pictures! Thank you! !